Three British tourists, including one child, died when their vehicle crashed while crossing a bridge in Iceland. 1; an SUV – carried seven Britons when the accident happened on Thursday at 9:30 GMT, said the Icelandic police. The other passengers in the car were seriously injured. The Toyota Land Cruiser crashed through a railing on a single-lane bridge in southern Iceland. Then he fell about eight meters high a riverbank. 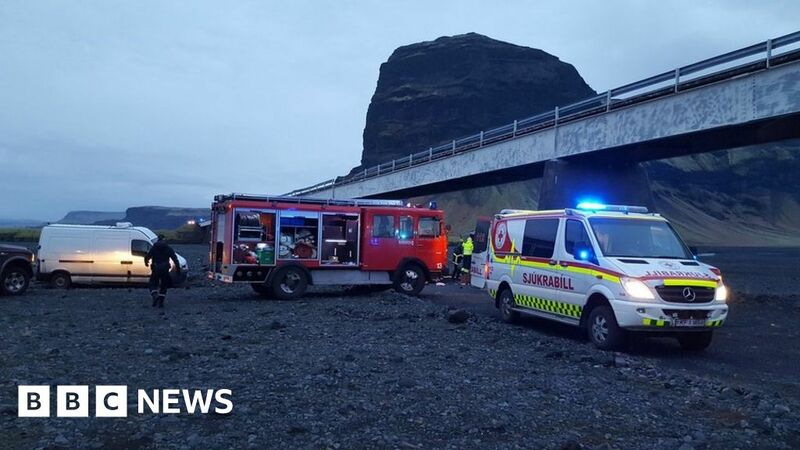 According to local media, the crash occurred on the Núpsvötn Bridge on the Icelandic Ring Road between the town of Kirkjubæjarklaustur and the Skaftafell area, which is part of the beauty spot Vatnajökull National Park. The four injured were taken to hospital with severe injuries, the police said. Two of the injured are children. Sveinn Kristjan Runarsson, Chief Superintendent of the South Icelandic Police said to the injured, "We could not talk to them about what happened." He said it was not clear if the seven people were related. One of the first people in the scene was the tour guide Adolf Erlingsson, who told the Associated Press: "It was awful.
" The car seemed to have been many meters from the ground where it stopped. We had difficulties getting everyone out. " Mr. Erlingsson told BBC News, "Somehow the driver lost control of the car and it just went through the railing and crashed onto the bench." "It's kind of sandy, there are no rivers, so it was not." not submerged in water. It just landed on a sandy bottom and was turned over and totally destroyed. He said he got out of his van and went to see if he could help. "The car was a total wreck. When I got there, four people got out of the car, one of them died. Then three people were trapped in the car. "The driver lived and was more or less under the dashboard, we tried to get the people out of the car and help them, it was a very difficult situation." He said that he had talked to some passengers who were "semi-conscious," adding, "I tried to talk to the driver a bit to reassure him."